SANTA TERESA, Puntarenas – Land crabs scatter from the dirt path in a parting motion, imitating the sounds of the nearby sea as their legs skitter across fallen leaves. The ones lingering behind toward the center of the road desperately lift up their pinchers to warn the oncoming mesh of fat tires and solid, red plastic. To their protruding eyes, the ATV moves by in a ferocious blur, kicking up waves of dust here on the road between Santa Teresa and Mal País on the southwestern edge of Costa Rica’s Nicoya Peninsula. The four-wheelers hum down these roads every day in large numbers, making the life of a crab even more stressful, while inversely easing the commute for locals and tourists. 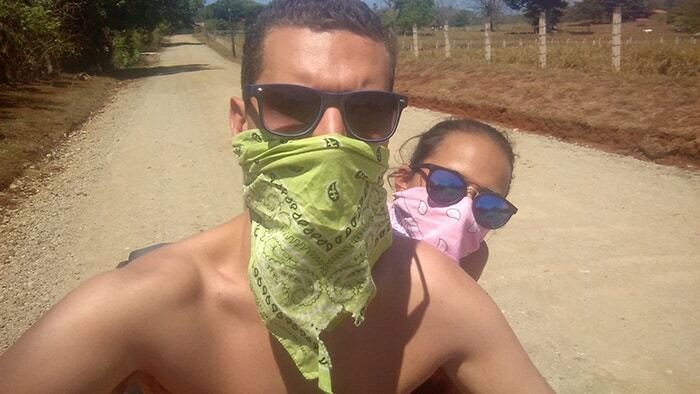 ATV tours and rentals are prevalent in Santa Teresa, where I recently spent a few days with my girlfriend. 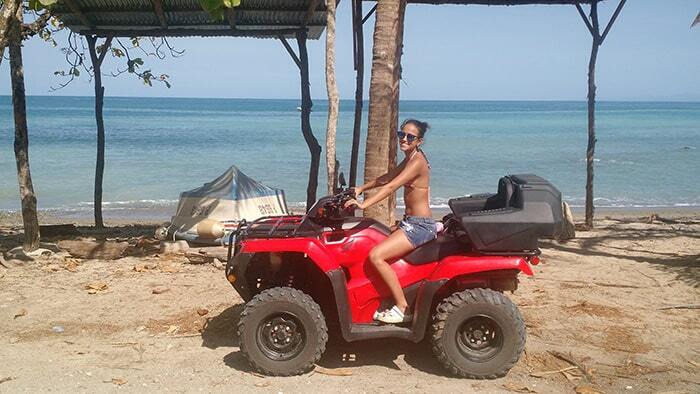 Whether it is businesses committed solely to all things ATV or hotels that rent out their own vehicles, hopping on a quad is an efficient and thrilling way to traverse the beautiful beaches located around the peninsula. Since we decided to rent an ATV from our hotel for eight hours at a cost of $50, we wanted to know how much we could possibly get done in that limited amount of time. As it turns out, we ended up visiting four beaches, a beautiful waterfall and one island cemetery, and dining on a killer lunch. For advice purposes, you may be better suited doing a tour if you are not familiar with the area and/or you don’t have a cellphone that can access network data. 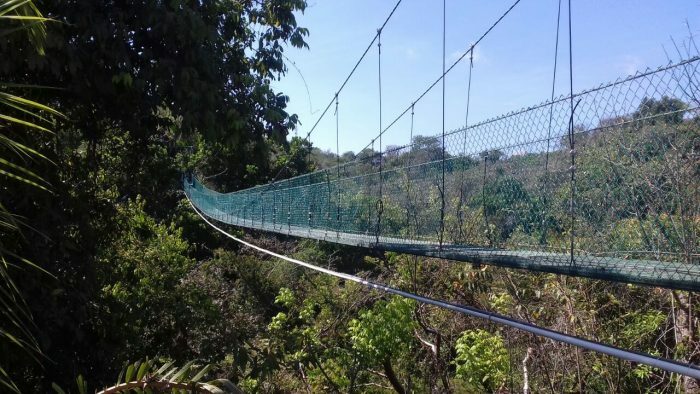 Otherwise, because of Costa Rica’s famous lack of signage, and the some-what labyrinthine structure of the back roads, you will most likely get lost. 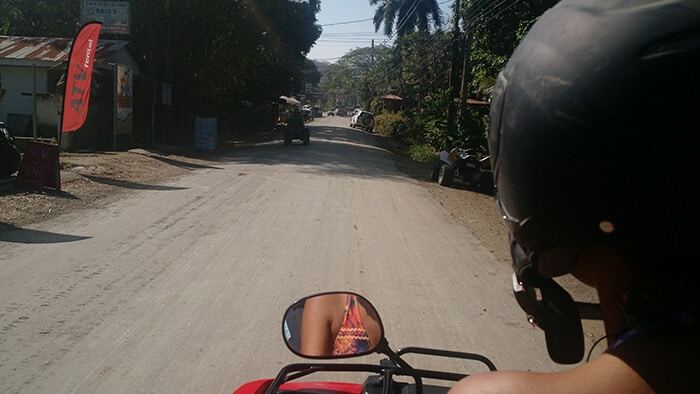 But if you do have a reliable phone with Google Maps or Waze, you should definitely skip the tour and go straight to renting your own ATV. That way, you can go at your own pace and make stops along the way at different beaches. If you’ve never ridden an ATV before, then also know that within minutes of driving one you should be fully comfortable with all the controls and steering. I say this after almost crashing right into the back of a parked truck. Once you get everything figured out with the easy-to-use ignition and gear system, the only trick is to be strong with the steering (i.e. don’t let it drag you into the back of a farmer’s parked car). We started our trip in Santa Teresa at 8:30 a.m. and went directly south to Mal País and then to Playa Cuevas, which is a secluded little beach on the border with a bat cave refugee and the Cabo Blanco nature reserve. The beach there is walled off by tall rock formations to either side, but makes for better swimming than Mal País because the shore is more sandy and less rocky. After the relaxing trip to Playa Cuevas, we headed back up north toward Santa Teresa to make the 40-minute cross to Montezuma. The drive was relatively easy, without any incidents besides a minor detour after taking the wrong way at a fork in the road, which only set us back 10 minutes or so. 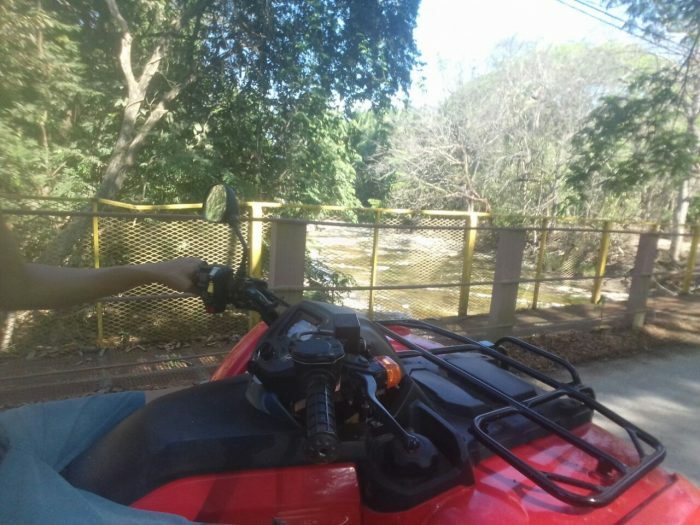 When we made it to Montezuma’s famous waterfall, we were eager to get into the shade and drink an agua de pipa sold to us by the same guachimán who would be looking over our ATV as we made the climb along the river and towards the falls. It had been exactly three years since I had visited Montezuma Falls last, but was almost instantly reminded why it’s my favorite waterfall in Costa Rica. With enough space for the sun to come in, the water is much warmer than most other waterfalls in the country. Plus, the pool-like calm of the water, with numerous places to jump from, is much more relaxing than, say, a waterfall like Arenal’s, which is stunning in beauty but constantly pushes would-be swimmers back with its force. 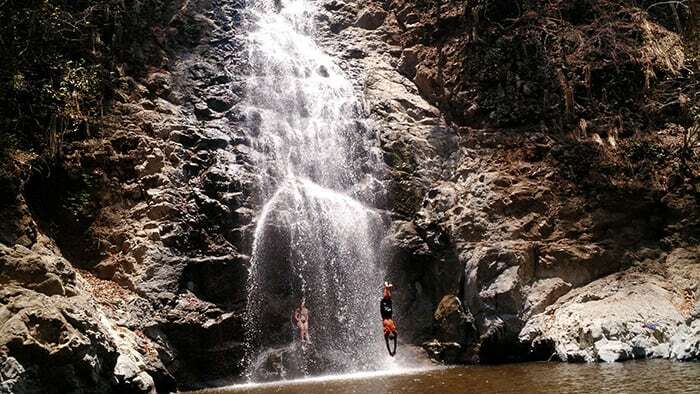 A local kid kept climbing the face of the waterfall, leaving the dozens of onlookers with their necks craned and mouths agape as he sprang through the falls. On two occasions, he made it to the very top before taking deep breaths and diving off into the pool below. After nearly two hours by the waterfall and some solid local entertainment, we proceeded to one of my favorite restaurants in Costa Rica: the simply named Bar Restaurante Montezuma. This was my third time here, and every time I’ve ordered a large red snapper. 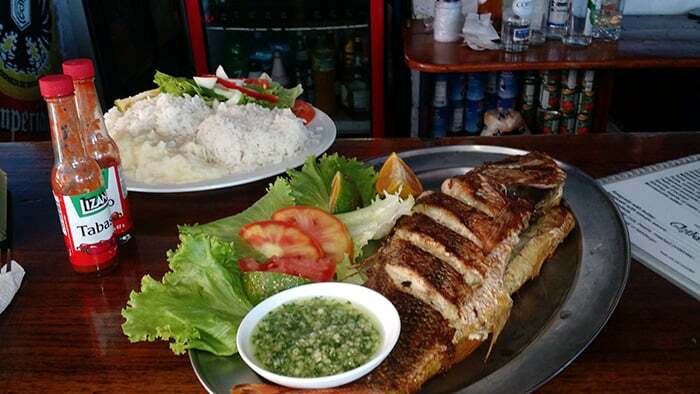 In a country that makes red snapper really well in almost any coastal town, the one here stands out for being perfectly cooked. It also comes with a side of rice, mashed potatoes, salad, and a delicious garlic-based chimichurri. Once we were done with lunch, we walked a few footsteps to the beach. Though it is somewhat small, the water temperature is perfect and there are no waves, making it one of the best swimming beaches around. “This is by far my favorite beach in Costa Rica,” my girlfriend said after just minutes of being in the water. She keeps a running tally in her head and said she prefers Montezuma over the other stellar beaches we’ve been to, like Puerto Viejo and Manuel Antonio. We got back on our rental and zoomed uphill toward a hanging bridge we saw on our way to Montezuma. Unfortunately, it was closed, but we did hear a tour group leader on the other side of the road point to a huge mansion and claim it belongs to Disney CEO Michael Eisner. Though I haven’t been able to confirm whether or not that is actually true, another thing ATVs can serve for in this part of the country is being like one of those unofficial star tours in Hollywood, if you’re into that sort of thing. We surely could have gone and seen Giselle Bundchen’s vacation home or Matt Damon’s stomping grounds, but we didn’t. 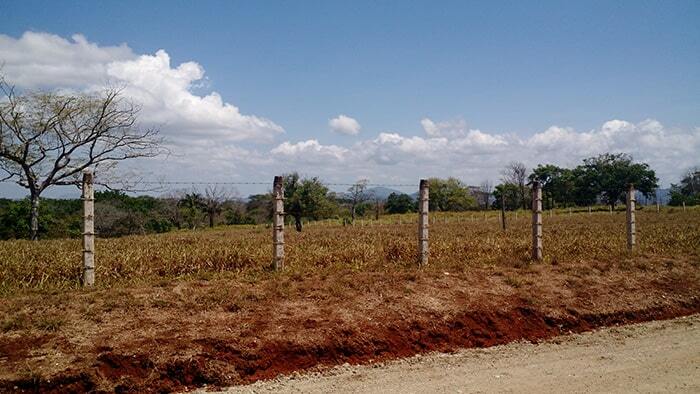 I’m of the opinion that the only celebrity house worth getting near in Costa Rica is Mel Gibson’s home near Playa Carrillo, just so you can lie on the stunning beach and point your nose at a man who wanted to privatize the public shoreline for himself. In departing Montezuma, we went south towards the idyllic fishing village of Cabuya. 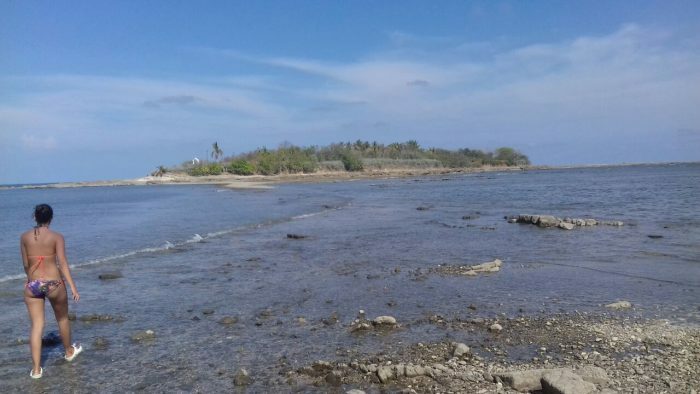 The major reason to see Cabuya is for the island cemetery attached to the shore by a thin walkway that appears during low tide. However, we made it too late in the afternoon – as the last of the fishermen were coming in for the day – and didn’t risk getting stranded on the spooky island. On our drive back, as the crabs parted again on our way to Mal País, I reflected on the day’s amazing adventure. We had gotten back to Santa Teresa around 4 p.m., with plenty of time to spare to speed up the hill and fill up the gas tank. After more than three years of being in the country, I can say this was one of the best adventures I’ve ever had and an awesome choice for anyone looking to travel at their own speed.